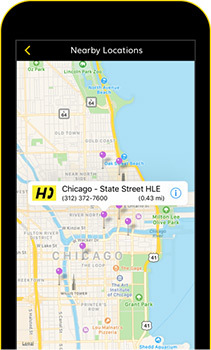 Access Hertz anytime, anywhere with our mobile app. Your rental is only a few taps away with the Herz mobile app. Reserve a car, update your reservations, or track your itinerary from your mobile device. Use your device to find the nearest Hertz location and reserve a car quickly. Save your login information to easily change or update your reservation. Now Available on ther Hertz iPhone App. With the "Find Parking" feature, powered by SpotHero, you can spend more time at your destination and less time circling it. 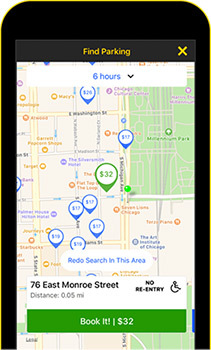 Find garages, compare prices and reserve a parking spot, all from your phone. 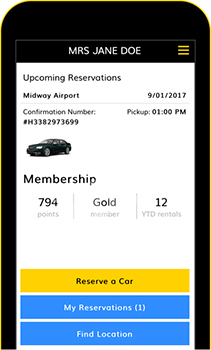 With the Hertz mobile app, viewing your upcoming trips is simple. You can also see your rental history, review your membership status and track your points.